Well, it’s time to make this Facebook official…and yes, I’m shamelessly using my blog to announce our good news. But that’s half the fun of having a new baby, right? Everyone gets so excited, and that’s always helpful for pregnant moms. You know…focusing on the joy, rather than all the crazy weird stuff happening to our bodies. We’re Having a Baby! Due July 4th, 2014. I seem to have a knack for holiday babies. After all, Ginny was due December 22nd. Here’s the big news: we know what the baby is (we found out just a couple of days ago). Rhoden Baby #2 is a boy! The ultrasound lady made me guess when we were looking at the screen, and even though he clearly looked like a boy, I didn’t want to guess the wrong thing…you know, if I was looking at the umbilical cord and not at what I thought I was looking at. Plus, I really felt like this baby was a boy, and I didn’t want to let my feelings cloud my judgment. Apparently, Thomas knew right away from the ultrasound image, but felt like I should say it out loud. Of course, he didn’t say that. So I just watched the screen, feeling a little like gullible was written on the ceiling and I didn’t want to be the one to say so. I make it sound like she was pushy or frustrating, but she wasn’t. She was actually pretty great. She really made the ultrasound interesting, explaining what we were looking at and making sure our questions were answered. I also really appreciated that a doctor came in right afterwords to talk about the ultrasound results, so I didn’t have to wait for my next prenatal appointment. And apparently, everything looks good. Our little 20-week boy looks good and healthy. For those of you wondering, I was at Adventist Hinsdale Hospital. So far, so good. Speaking of, I do intend to continue posting healthy recipes, weight loss tips, and workout DVD reviews, as well as baby posts. Obviously my life is going to be even more baby-centered, but it’s important that I continue to eat healthy and stay active, and writing about both really helps me out. And as always, I hope reading this blog helps you in some way too. 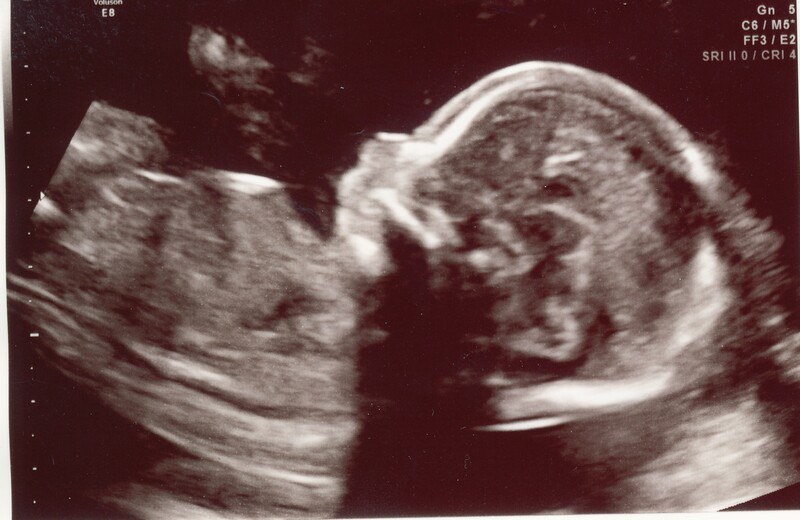 Ultrasound at 19 Weeks for Rhoden Baby #2, Due July 4th. Congrats!! It is a boy!!! Little brother for Ginny!!! Blessings from God! Congratulations!!! This is awesome news.